La linea A22E offre pulsanti di arresto di emergenza con diversi tipi di teste. Viene fornita un'ampia gamma di accessori per applicazioni flessibili. 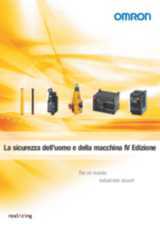 Sono disponibili diverse combinazioni di contatti per garantire facilità di installazione e manutenzione. Meccanismo di protezione dita sulle unità dei contatti fornito come caratteristica standard. Per fori nel quadro diametro 25, utilizzare un anello con diametro 25. Note:	The A22Z-B101Y Control box is used. 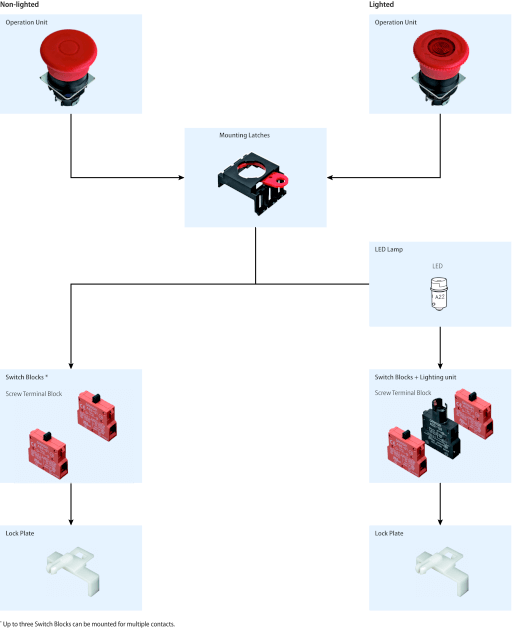 The Operation Unit, LED Lamp, Mounting Latches, and Switch Blocks can be ordered separately. Use them in combination for models that are not available as assembled Units. These can also be used as inventory for maintenance parts. Order Switch Blocks only when adding or replacing them. Used when changing the lighting method. Order Mounting Latches only when mounting Switch Blocks or Lighting Units that are purchased individually. Use to fix the lever on the Switch. The A22Z-B101Y does not support 2NO, 2NC, or 1NC + 1NO two-contacts Switch Blocks. These LED lamps are for exclusive use with the A22N and the A22NE-P. These are provided with the completely assembled set of lighted models. Order LED lamps only when replacing them. These are provided with the completely assembled set of lighted models. Order Lighting Units only when replacing them. This Mounting Latch is for exclusive use with the A22NE-P. It is provided with the completely assembled set. 4. The A22NZ-A-B01Y Control Box cannot be used in combination with the A22Z-3476-1 90-dia. Legend Plates for Emergency Stop or the A22Z-EG ⬜ E-stop Shrouds. Used in combination with the washer rubber when the level of protection is to be met between panels. Cannot be used in combination with the Control Boxes. Used for covering the panel cutouts for future panel expansion. Plastic connector used to extend a cable from the Switch Box. Use when mounting to a panel with a 25-dia. hole. Use when mounting to a panel with a 30-dia. hole. A rubber washer (A22Z-R) is provided with the product. The body is equipped with a Lock Ring. This Lock Ring is used when a more secure lock feature is required . Used for tightening the mounting ring from the back side of the panel, and for removing the cap in lighted models. Legend plate for EMERGENCY OFF is not included. Provides SEMI-S2/SEMATECH APPLICATION GUIDE FOR SEMI S2 compatibility. Use with an A22E with EMO indication . Legend plate for EMERGENCY STOP is not included. Provides SEMI-S2/SEMATECH APPLICATION GUIDE FOR SEMI S2 compatibility. Use with an A22E with EMS indication. Spacer Unit is not included. Use together with an A22E Emergency Stop Switch. One Spacer Unit is included. Two Spacer Units are included. 1. These Shrouds are for use with the equipment only that conforms to SEMI standards. Do not use them for any other applications (e.g. 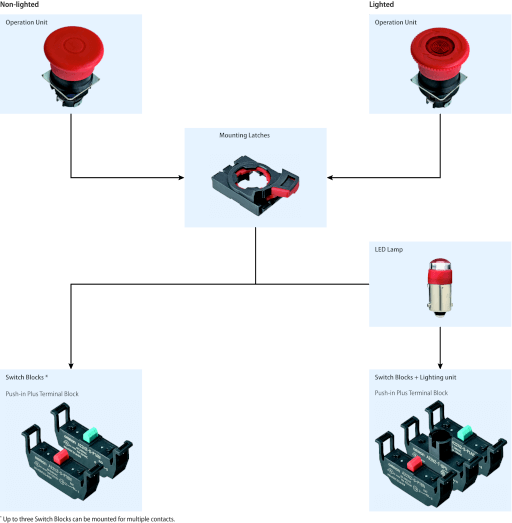 emergency stop switches for machines or devices such as Machine tools, Printing presses, Industrial machinery, etc). 2. The Control Boxes cannot be used in combination with the A22Z-3476-1 Legend Plates for Emergency Stop or the A22Z-EG ⬜ E-stop Shrouds.